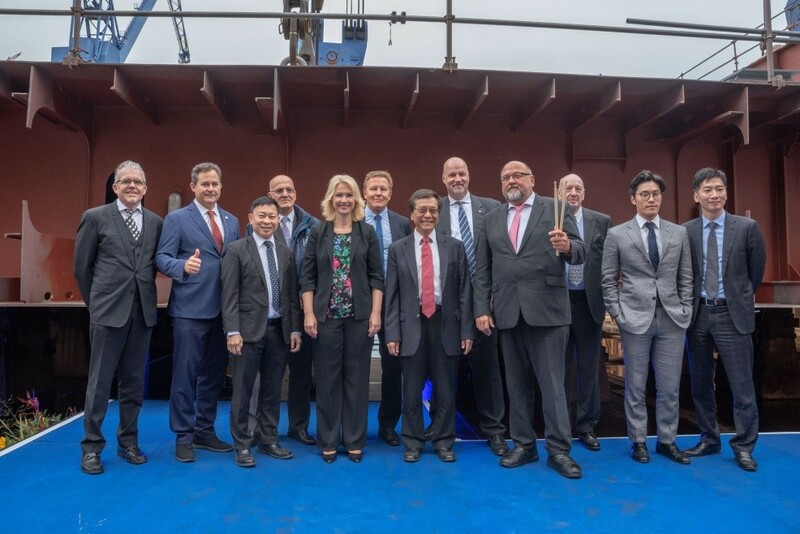 Dream Cruises have laid the keel on their Global Class flagship at Genting Hong Kong’s MV WERFTEN shipyard in Rostock on Tuesday. The “laying” of the first section measuring 22 metres long, 26 metres wide and weighing 410 tons, about half of the full keel, marks the start of construction of the largest cruise ship ever built in Germany. Approximately one thousand shipyard employees, partners, and guests from the worlds of business and politics accepted the invitation to the event. Prime Minister Manuela Schwesig, Minister of Economic Affairs, Harry Glawe, Genting Hong Kong’s Executive Chairman Tan Sri Lim Kok Thay, Group President Colin Au, Dream Cruises President Thatcher Brown and MV WERFTEN’s CEO Peter Fetten placed the traditional lucky coins in the keel before the 95-metre high gantry crane lowered the section into place. Genting Hong Kong also live-streamed the ceremony via the Dream Cruises Facebook Page, inviting viewers from around the world to celebrate alongside the VIP guests in attendance. Additionally, over 1,000 business partners, travel agents, media and special guests also witnessed the live ceremony at special events across the company’s key markets including in Hong Kong, Beijing, Shanghai, Guangzhou, Singapore, Taipei, Tokyo and Sydney. “The Global Class is designed from the keel up with more exciting public areas and larger cabins than traditional cruise ships,” said Tan Sri Lim Kok Thay, Chairman and Chief Executive Officer, Genting Hong Kong. 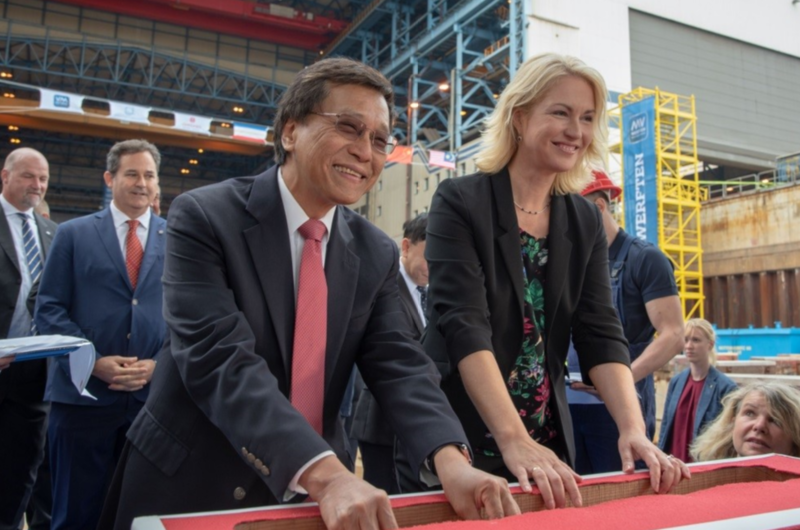 “Ownership of MV Werften also means greater flexibility in incorporating the latest technical advancements for the shipyard to build the best cruise ship in the world,” said Thatcher Brown, President of Dream Cruises. Peter Fetten, Managing Director at MV WERFTEN added: “We are creating something truly great. After an intensive engineering and design phase, today’s keel laying marks the next stage of the manufacturing process of MV’s first mega-ship…its dock assembly. Production of this 204,000 gross ton ship, which will measure 342 metres long and over 46 metres wide, will take place in parallel in Wismar and Rostock. The 220-metre-long midship will be manufactured in Rostock and will move to Wismar in 2019, where the bow and stern, as well as the superstructures, will be mounted. The 2,500 passenger cabins produced by MV WERFTEN Fertigmodule in Wismar will also be installed in Wismar. A total of around 600 companies will be involved in the construction process. The Global Class ships will join the Dream Cruises award-winning fleet, allowing Dream Cruises to offer cruises all over the world to become “Asia’s Global Cruise Line”. Amenities will include a theme park featuring a roller coaster with virtual reality, a Cineplex, Asian spa in addition to a Western spa, ample shopping facilities as well as authentic Asian and international dining experiences and fast food restaurants. Her 2,500 cabins will be able to accommodate up to 5,000 passengers on a twin share basis and can cater for up to 9,500 passengers during peak holiday periods. As safety is of primary concern at Dream Cruises, sufficient life-saving facilities and ample width of fire stairs will ensure the well-being of all guests on board the new Global Class vessel. The celebrations kicked off in Sydney on Thursday night. Please excuse us for filing this story a day late – we’re still recovering from all the champagne we drank on the night.